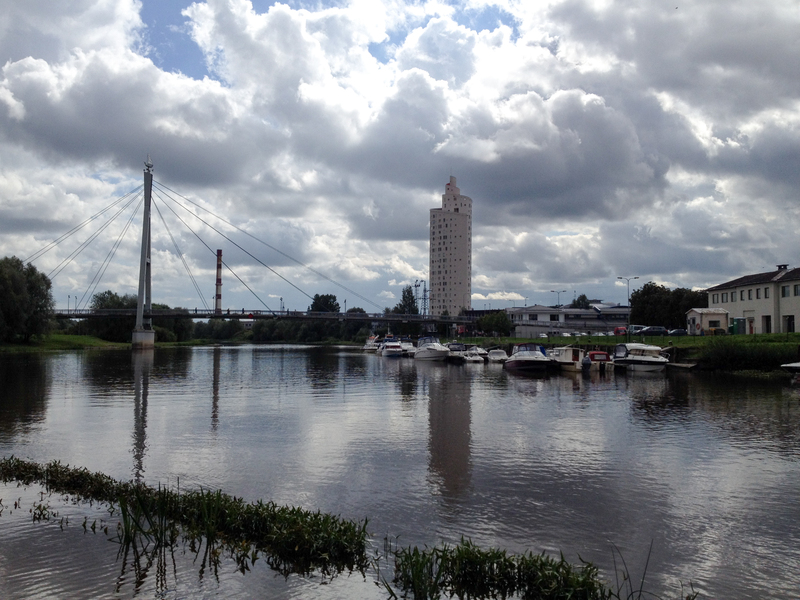 I took one photo in Tartu, which stands opposing the whirlwind night and day I spent there. You see, Tartu isn’t undeserving of photos, but the hours I spent there were filled with people moreso than scenery, and we ran through the dark for more hours than we spent traipsing through the daylight. Travel expanded this day for me. I went from Riga to Sigulda to Riga to Tartu, Estonia. The bus pulled in at 11:15pm and Tiina, my BeWelcome host, was there at the bus station waiting for me. She brought me back to her place, fed me a snack, and then we set out for the night. Tiina had just finished her last master’s exam for her degree (Finno-Ugric languages—how cool is that?) and we were meeting some friends of hers to celebrate. This gathering also entailed showing the visitor, me, all aspects of nightlife Tartu, a tour of sorts. If you think hanging out with a troop of strangers is awkward, you should spend more time with these welcoming types. Over and over I find that the people I meet through hospitality websites are among the most open and genuine there are. Despite the long hours, I sat in the first bar with Tiina and two of her friends, also foreigners to Estonia in fact, and we chatted amicably. Ready to go and begin the tour, we stopped in another supposedly cool bar, now packed with Erasmus students swarming along on their first bar crawl of the school year. We walked through the taken seats and moved on. Upstairs to a weird retro disco bar we went, empty but for two creepy-vibing men and one woman, who grabbed onto me and blurted something in Estonian that I obviously didn’t understand. The song changed and she motioned us off the floor. What? I took this moment to run back down the steps and the others piled out after me, laughing. The women wanted us to leave the dance floor to protest a song she didn’t like, but we just left. They had shown me the sight of this funny place, and so and we walked on giggling. Another bar. It was too crowded so we sat on the stairs near the entry, talking until it closed. And then, a club. We trooped in. I had spent the day hiking and was dressed in jeans and I don’t even remember what. A hoodie probably. Tiina likewise was wearing casual clothes. Around us, people all done up, looking for something, radiated self-consciousness, bumping into others casually. We danced like crazy and how glorious, I thought, it is to just be a little mad and uncaring and comfortable just as you are. Tiina bounced around in front of me and I admired her so. We got hot from dancing and parted for the last stop on the tour, the bar of sticky beer floors and Estonians slumped over in drunken sleep. I navigated my way through the bodies, observing. We ran into Tiina’s friends at every turn and chatted for moments. And finally it was after 5am and Tiina and I walked back to her apartment, not to sleep right away, but to chat, conversing more openly than I talk to many people I’ve known for much longer than 12 or so hours. In the morning, or rather around noon, Tiina and I went for a breakfast of crepes. Then she showed me Tartu by day. We walked through the streets that looked much different now in the daylight. We went to the market and Tiina bought some beans that her grandparents would cook for her when she was younger. We went and sat by the river for awhile, just talking. Then, tired still, we went back to her place, where Tiina boiled the beans in salty water for a tasty dinner. She helped me buy my ferry tickets from Tallinn to Helsinki and arranged for me to stay in her friends’ place in Tallinn the two nights I’d be there. We had to walk quickly to catch my bus since we had been lying about chatting for a little too long. We hugged and wished that we’d see each other again. In fact, I was to see Tiina just a day later in Tallinn. All this to say: it is the genuine to their core people who I admire. It is the open and the embracing people. And more often than not, I find these people while traveling, because they’re the ones who welcome the wanderers in, with a full understanding. It is with these people that you don’t need to feel at all closed and shifty; you just act as your true self along with them and there’s no exclusion. Tiina taught me that the only non-borrowed word in Estonian with the stress not on the first syllable is aitäh, thank you. Tiina clarified for me why I stubbornly stick to using hospitality exchanges as much as I can—for the people I meet, for the people I want to meet again. I will always remember crazy dancing in the club, appearing just as I was, not even caring. Not even caring. Aitäh, Tartu; aitäh, Tiina.